I strolled south today, to see how Nowa Iwiczna's new developments are coming on. Where once were gaps and shortcuts between houses, now the interstices have filled in. My walk home was frustrated by getting to the end of several cul de sacs that once had informal footpaths at the end of them; I had to turn around and backtrack, not something I enjoy doing. In other words, housing density is high, and there's plenty of development still taking place despite the economic slowdown. 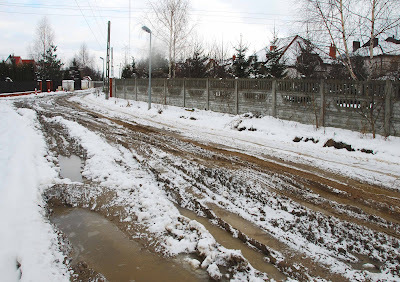 Below: How muddy would you like your street? This is the western end of ul. 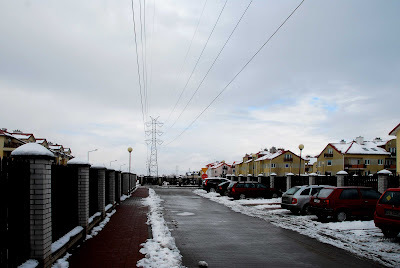 Przebiśniegów ('Snowdrop Street'). A quick look on Google Earth shows nothing here, yet currently there's new construction aplenty, and the trucks that will turn unasphalted roads to quagmire. Nowa Iwiczna's southern border is demarcated by the railway line running to Siekierki power station (across the tracks is Stara Iwiczna). This unelectrified line is freight-only, which swings left away from the main Warsaw-Radom railway just beyond Nowa Iwiczna station. 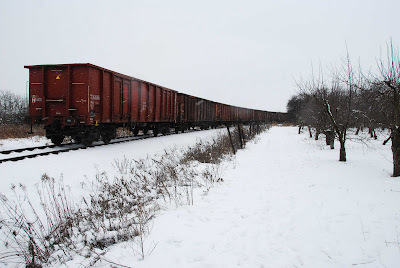 Below: the rear of an empty coal train running back to the sidings at Okęcie. To the right, an orchard. Poland's unemployment has just jumped to 10.5%, however the national figure does not paint an accurate picture. The big cities (Warsaw, Katowice, Poznań, Kraków, Wrocław, the TriCity), have unemployment between 2% and 4%, while in small town and rural Poland, districts (powiaty) with unemployment of 20% or even 30% are not uncommon.